184 pages | 29 B/W Illus. In the past, ‘Global Management’ meant optimizing production and commercialization activities around the world in an international business context. With the emergence and rise of the creative economy, the global game has changed. This book is about the global management of creativity and related innovation processes, and examines how companies, organizations and institutions can foster the transformation of an original idea to its successful execution and international diffusion. The Global Management of Creativity gives a clear framework for analyzing creativeness in organizations in an international context, and pinpointing important key elements that should be tracked. Comprising expert contributions and written by a wide array of leading scholars in economics, management of innovation and creativity, this book is an insightful resource. 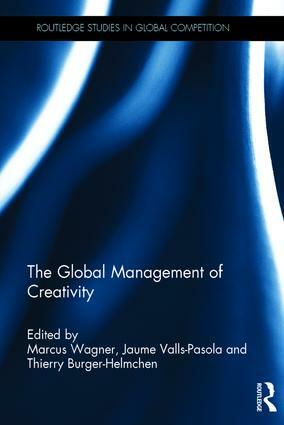 This volume provides empirical and theoretical material for managers, students and academics in the field of international management of creativity and innovation. It is also suitable for those who are interested in industrial economics, management of technology, and innovation and industrial studies. Marcus Wagner is a Full Professor at the University of Augsburg, Germany, where he holds the Chair in Management, Innovation and International Business and is an associate member of the Bureau d’Economie Théorique et Appliquée, where he held an Intra-European Marie Curie Fellowship from 2006 to 2008. Jaume Valls-Pasola is Professor of Management and Business Administration. After a period of 12 years at the University of Girona, in October 2006 he joined the University of Barcelona, Spain, where he is currently responsible for the UB Entrepreneurship Chair and coordinates the UB Business and Management Research Group. Thierry Burger-Helmchen is a researcher at BETA (Bureau d’Economie Théorique et Appliquée, UMR 7522 – CNRS) and Dean of the Department of Economics and Management at the University of Strasbourg, France.